Check it out: Stamp street-art! How wonderful. I spotted this at the Laneway Music Festival in Footscray (Melbourne) on the weekend. The festival was great fun - Bat for Lashes headlined, but Alt-J ( ∆ ) were possibly the highlight for me... they sounded amazing and were great fun to dance to. Anyhow it is not all that regularly that the worlds of rock'n'roll and stamp nerds collide, so I was pretty thrilled to see these paste-up images of an early and iconic Australian Stamp at a music festival. I do actually have this stamp in my collection, courtesy of Grandma Nellie. Although the stamp I have is not in great condition. The stamp was part of the George VI series of definitives released in 1950-51. The thing that makes me uneasy about the image is that it was released in that time well before the 1967 referendum which recognised indigenous people as citizens. 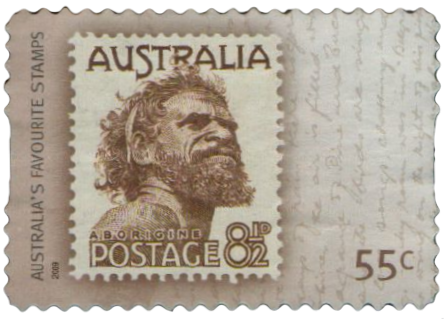 So this image smacks of paternalism to me - while it is depicting, and in a way celebrating, the nameless Aborigine on the stamp, the image seems to be loaded with the racist ethnocentric assumptions of the day. It is an enduring image, even if it is a racist one. And in 2009 another version of the stamp was celebrated as one of "Australia's favourite stamps." I think the image reads slightly differently in the 2009 version than it did in the 1950/51 version. It is a bit more like, "Look! We love Aborigines! We always have: check out this old stamp!" And of course that is blatantly untrue. 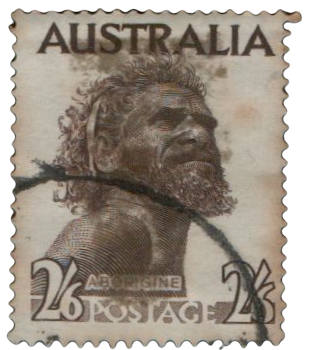 But I see an attempt at reconciliation in the 2009 stamp, a more genuine respect that doesn't have the same patronising tone of the 1951 release. And what of the 2013 paste-up on a brick wall in Footscray of the same image? I love it. Hi, Helen. You really know how to have fun! This Stamp street art is sublime. I did not know this stamp, it is fantastic. Try washing this stamps it may improve. www.cartasenmibuzon.blogspot.com if you wish to see the pictures of all the letters that I have received from whole world. www.sellosparacambiar.blogspot.com where I show all the stamps that I have available for exchanges.